Large-scale B.C. mining developments, in the headwaters of the world’s most valuable salmon producing watersheds, have become a globally significant issue. In an outpouring of concern, many Alaskans and elected leaders have take action. You can see this impressive and diverse list below. 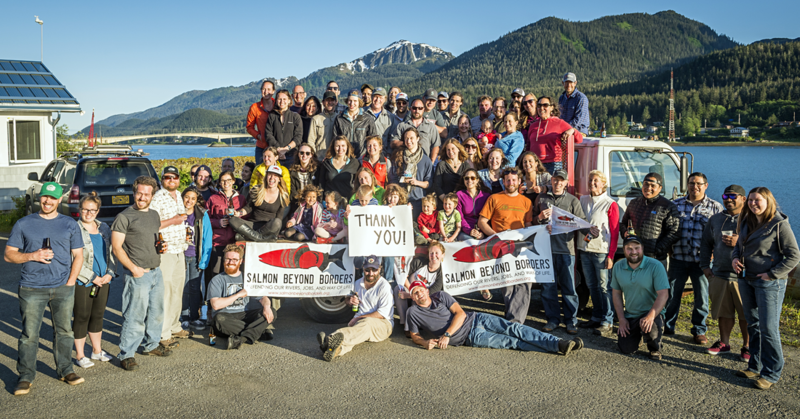 Supporters of the Salmon Beyond Borders campaign gathered in Juneau on June 7, 2016. Photo by Chris Miller. Thank you to the State of Alaska, Alaska's Congressional Delegation, Tribal Governments, & elected leaders in Washington for working to defend Southeast Alaska and B.C. 's shared transboundary salmon rivers!